Why throw anything out when you can just purchase more filing cabinets? 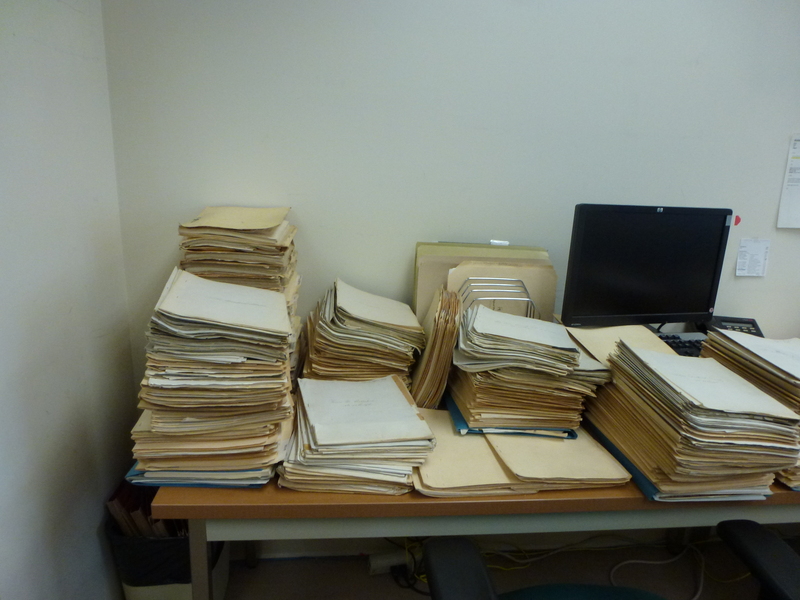 The problem with buying more filing cabinets and storage units and bookcases is that it is less likely that anyone will ever need to weed the files. 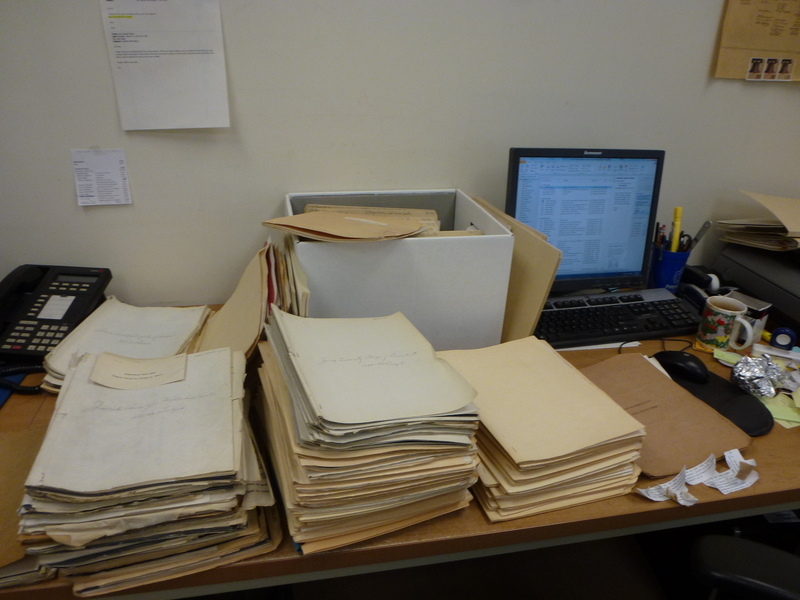 Weeding the files now, as part of our project to make the collection accessible, we have found a tremendous amount of budgetary documentation in draft form that is not of permanent, archival value once the budget is finalized and published. There’s no quick way to weed a file, of course, so some files are being weeded and others, because of the speed mandated by our minimal processing procedures, will include some of the draft documentation. 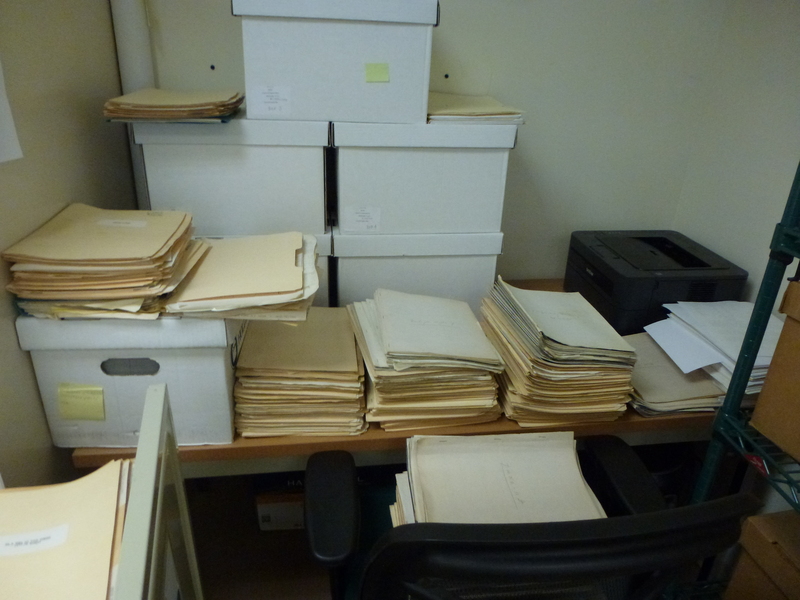 The good thing about buying more filing cabinets is that some materials that might have been weeded out when they reached the end of their active use in the office, but were instead retained, have proven to be of value in other ways – perhaps, like the memo above, as a glimpse into the corporate culture of Federation in the last few years before the merger with UJA. And a glimpse as well into the general American office culture of the time, when space was not the issue it is today, and growth was always expected. 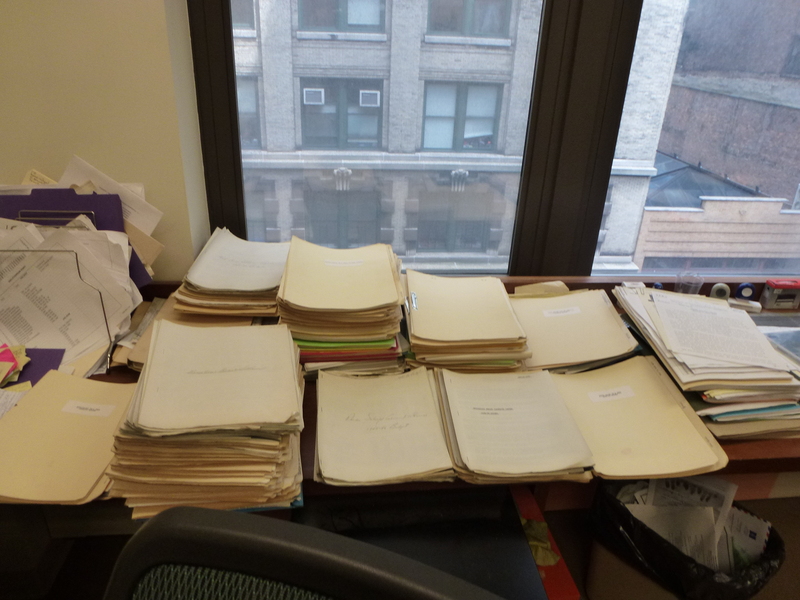 The digitization of the UJA-Federation of New York Oral History Project is now complete. You can access all of the oral histories either through the finding aid for the Oral History Project, or through the Center for Jewish History’s Digital Collections. Available now are files ranging from the audio and transcript of the interview with Nathan S. Ancell to the transcript of the interview with Gary Zucker. Special thanks goes to Amit Primor of the Gruss Lipper Digital Lab at the Center for Jewish History for his diligence and hard work in digitizing hundreds of audio tapes, creating both archival copies of the interviews, stored in a digital repository, and access copies of the interviews, optimized for listening online. It has been exciting to have completed the digitization of the Oral History Project and we plan to soon begin another digitization project. We are now reviewing other possible candidates for digitization, including the ledgers of the Brooklyn Federation of Jewish Charities. In 1944, the Brooklyn Federation merged with the Federation for the Support of Jewish Philanthropic Societies of New York City to become the Federation of Jewish Philanthropies of New York, so the Brooklyn Federation material would provide much information on Jewish philanthropies operating in Brooklyn between 1909-1944. But the Brooklyn ledgers are only one of many possibilities. As we continue to process archival material, we have documented correspondence, photographs, publications, and ephemera that might serve as candidates for possible future digitization. The opportunity for research and learning using the audio files and transcripts abound. We look forward to answering any questions that may arise regarding the content of the interviews, the participants, or their role in UJA-Federation of Jewish Philanthropies of New York. Spending many months processing the files of FJP’s Budget Department has given us a good understanding of the breadth of knowledge among the Budget Department staff members, as well as a sense of their extraordinary productivity. Most budgetary documents intended for the use of Board of Trustees members, members of the Distribution Committee and its numerous subcommittees, agency leadership and FJP Executive staff, were distributed under the signature of the Budget Director. Of course he was supported by a large staff of people who worked in the Budget Department for decades. Interoffice memoranda often indicated who within the Budget Department was doing what work, but their work was probably invisible to the members of the Board of Trustees. No matter who did the work however, some of the reports are remarkable for their clarity in explaining the intricacies of complex budgetary issues to lay leadership (as well as the non-financially-knowledgeable researcher or archivist). It is remarkable also because it is obvious from the reports how much information the Budget Director had to be aware of in any given budget year. Each member of the Budget Department staff, no doubt, had their areas of expertise, but in presenting a budget to the Distribution Committee the Budget Director clearly had to keep track of the programmatic and budgetary details for over 100 separate agencies. 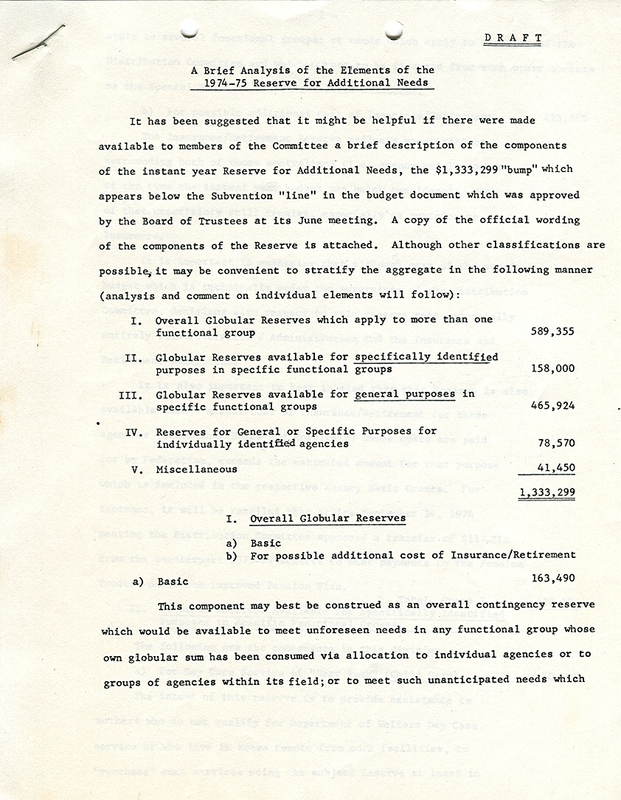 For example, in the draft version above of, “A Brief Analysis of the Elements of the 1974-75 Reserve for Additional Needs”, Budget Director Jack Applebaum explains what the “Reserve for Additional Needs” is, how much of this reserve is assigned to which areas and how the total figure is determined. You can note near the bottom of the page that very small reserves are allotted for operating costs for a pool opened just a year earlier at Bronx House ($5000); and for general operating costs at the Central Queens Y ($15,000). 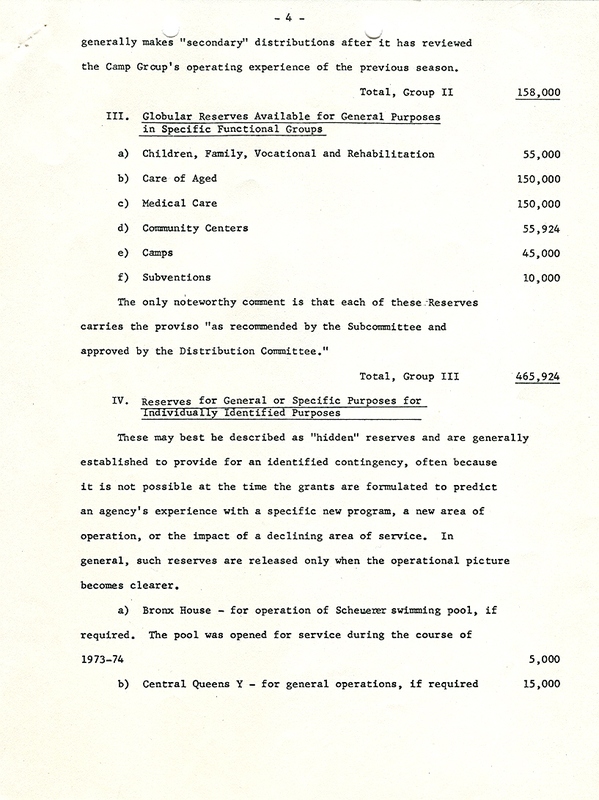 Because of the level of detail in this report, as in so many Budget Department files, a researcher looking for more information on Social Work education, the Jewish Welfare Board or the Muehlstein Foundation, could start with this simple funding document and find additional information elsewhere in the Budget Department series, elsewhere in the FJP materials, or elsewhere in the AJHS collections. The level of detail was required because the FJP Budget Directors felt it necessary to document their budgets so that the leadership could make well-informed decisions. And in the process they left us a rich legacy of historical documentation in the UJA-Federation of New York collection. The digitization of all of the UJA-Federation Oral History Project interviews beginning with the letter ‘S’ is now complete. 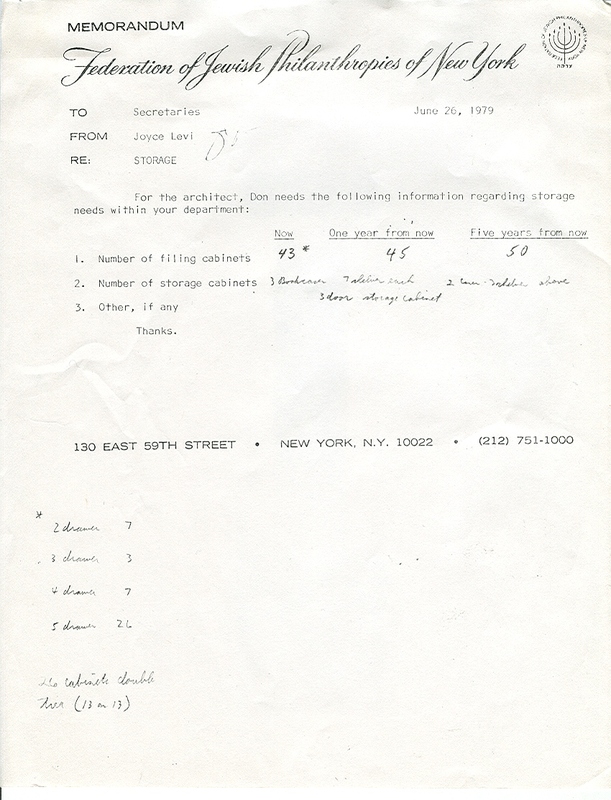 In addition to the many other interesting oral history interviews available, Sanford Solender, Executive Vice President of the Federation of Jewish Philanthropies from 1970-1981, and Stephen Solender, Executive Vice President of UJA-Federation of Jewish Philanthropies of New York from 1986-1999, are available through the finding aid for the UJA-Federation Collection and the Center for Jewish History’s Digital Collections. Sanford’s discussion with Benjamin Buttenwieser, digitized and made available last year, is also online. In the coming weeks, we hope to make available the remaining oral history interviews and will announce when this important milestone is complete.